Although the fencing surrounding your swimming pool is there primarily for safety, that doesn’t mean it can’t also blend seamlessly into the landscape and enhance the overall aesthetic of the area. Before choosing fencing you should determine your style preference and whether privacy or an unfettered view is most important. You might choose a tall, wooden fence, which creates a secluded and private swimming space. Conversely, a fence made from glass could be preferred to enhance views toward the ocean, the woods or the countryside. It’s important to remember that a fence must be at least four feet high. Typically, pool fences are made from bars, panels and planks. Bar-style fences are usually constructed from steel, vinyl, aluminum or iron. Basic lattice slat or post fences are made from wood or vinyl. A wooden fence will cost between $10 and $30 per linear foot of coverage, while a vinyl fence is between $25 and $40 and simple chain link fences are between $8 and $12. On the upper end of the spectrum is a frameless glass fence, which ranges from $300 to $500 per foot, depending on the thickness of the glass. Aside from budgetary reasons, your choice of fencing really depends on the atmosphere you are looking to create. Glass fences, although pricier, allow you to see the pool from inside and outside the home, and provide a sleek, high-end appearance. Glass panels are also more resistant to damage caused by weather and pool chemicals than metal and wood. A simple black metal post fence is classic, easy to manage and creates minimal obstruction. The same can be said of a wood lattice fence, while white vinyl or a wood bar-style fence gives your pool area a clean, modern look and fits in nicely with a contemporary-style house. An iron bar design set between concrete structures will help the fence blend into the landscape. If you’re seeking privacy, a tall wooden fence does the trick. When topped with latticework, it’s a classic New England look. A natural stone wall also blocks outside distractions and allows you be creative with the use of different stones, walls and barriers. For those with infinity pools or stunning views, a brick-and-pillar barrier fence or a simple mesh fence will provide safety without blocking the scenery. There are numerous intriguing, creative fencing options to spruce up the area surrounding your pool that give you the opportunity to be as imaginative as you like. First and foremost, a fence is for safety. But it can also make a design statement. 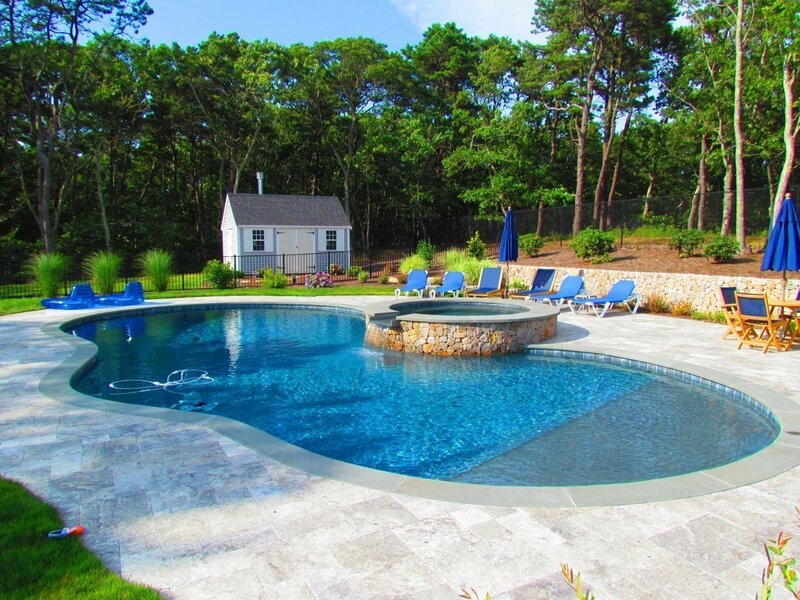 Call us at (508) 432-3445 today for a free swimming pool consultation.